Cooking wild game is an art form. Luckily for me, Buffalo Trace and Danielle Prewett from Wild & Whole has mastered. It was an honor to cook some venison backstrap over the fire on a rustic day in Nashville, TN at Wedge Oak Farms. We started by creating a fire ring using the local rocks from on the property. Once that fire was lit, it was time to prep the food. Potatoes, asparagus and other goodies went into the preheated skillet in the fire ring. We topped all of that with some farm fresh eggs from the chickens found on Wedge Oak. Next, I let Danielle teach me some of her expertise in wild game. We sliced into some venison backstrap to make medallion steaks that will be seared in skillets. When the steaks were done, we deglazed the pan using Buffalo Trace and some other fun seasonings. Topped the venison in the sauce and started to eat! It was such a pleasure to talk hunting and cooking with Danielle! We stayed till the fire died and enjoyed some more Buffalo Trace to top it all off! 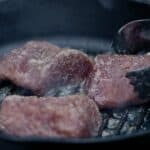 Make some delicious venison backstrap with a breakfast skillet to wake up next to the fire. Build fire using log cabin method. Wait until it’s nice and hot to pre-heat your cast iron skillet. Let cast iron skillet pre-heat for 2-3 minutes before cooking. Add potatoes & olive oil to skillet and let cook for 10 minutes stirring occasionally. Next, add asparagus, salt & pepper and let cook for another 5 minutes. Pre-heat another skillet over fire for the venison. Season venison with salt & black pepper. Add butter to skillet and let melt. Add venison to skillet and let cook for 2-3 minutes per side or until done to you liking. Pull venison off skillet and let rest for 8 minutes. Add Buffalo Trace and all deglazing ingredients above to skillet and let cook for 1-2 minutes. Stir often. Top venison with Buffalo Trace Deglaze Sauce, slice and enjoy!